The English language school had lost its state accreditation in February. HUNDREDS OF INTERNATIONAL students have been left with questions to be answered after an English language school in Dublin city centre closed its doors. Eden College on Burgh Quay in Dublin told students today that it had ceased trading with immediate effect. The school lost its state accreditation in February of this year after it was found to be non-compliant with standards of English language teaching. The school is believed to have had at least 400 students, while some 40 staff members were told on Friday that they were being made redundant. Former Minister for Education Batt O’Keeffe resigned as president of the school earlier this month. “The Board of Eden College regrets that Eden College Dublin has ceased trading with immediate effect”. The College has made a number of arrangements with other colleges for the continued provision for the majority of courses without any additional fees for tuition. Please note, though, students are required to contact the student review group in INIS [the Irish Naturalisation and Immigration Service] to finalise the transition. Students were asked to report to the school’s reception this week for further details. Some students on Facebook and Twitter were unhappy with the sudden closure of the school. “I want to study. Simple as that,” Lua Bilhalva wrote on the school’s Facebook page. Another said that she had gone to the school today but said there was no-one there to answer her questions. “We don’t know anything about certificate, attendance or which new schools the students are going,” wrote Camila Cirne. “Please, we need to know who is going to support us about those details”. The Irish Naturalisation and Immigration Service is deliberating over how to deal with the non-EU students at the school who are in Ireland on visas, but has said there is “no immediate threat to students’ immigration status”. “All current permissions remain intact,” the INIS said this afternoon. The INIS, which falls under the Department of Justice, has advised students not to pay any money or to enrol with another college without first contacting them. 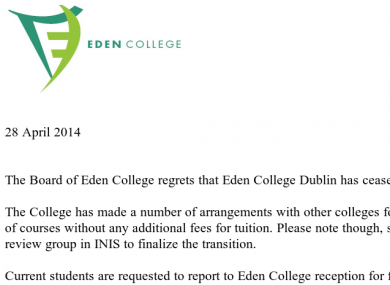 Email “Hundreds of students left with questions after Eden College closes its doors in Dublin city centre”. Feedback on “Hundreds of students left with questions after Eden College closes its doors in Dublin city centre”.